Emerging Food Brands looking to grow have limited options financially. Many we talk to are self-funded through sales. This can be hard when they need to come up with the capital to buy raw materials, packaging, or labels to convert into final product when they need to fill orders. The more the sales, the better the opportunity is to have the cash for the next order with a little left over for profit. This series explores the finance options Emerging Food Brands have if they want to grow. John Hanak (Moderator): Managing Director of Purdue Ventures. John is the Managing Director of Purdue Ventures and also an Entrepreneur in Residence at the Purdue Foundry. Andrew Bluestein: Co-Founder & Managing Partner, Bluestein & Associates. 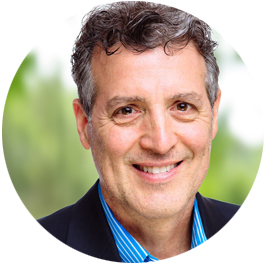 Andrew is the co-founder and Managing Partner of B&A, which includes developing the firm’s investment strategy, leading the investment committee, and advising portfolio companies. Andy Miller: Managing Director, Ouabache Investments. Andy leads the Ouabache team bringing prior experience as Corporate Development Leader at Weaver Popcorn where he focused on sourcing and evaluating larger bolt-on opportunities. Jacob Schpok, Entrepreneur-in-Residence (EIR), Elevate Ventures. Elevate EIRs provide first-time entrepreneurs with business advisory services to help them navigate the uncharted waters of starting a business, from launch to exit and every decision in between. 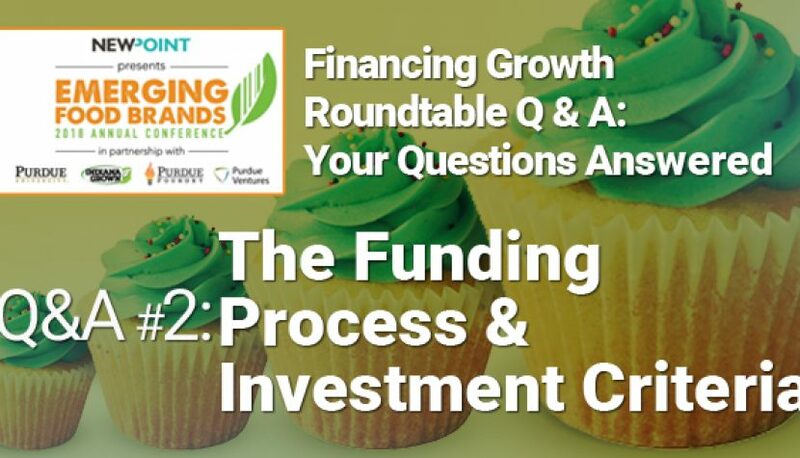 John Hanak, moderator: This question is, “What’s the overall funding and investment process like?” What I’d like to do, starting with Andrew, is if you can just briefly talk about that, but also talk about it from the perspective of readiness. The readiness of the team, the preparedness of the model, if you could talk about that, so they could get the sense of what the process is like. That’s a way for us just to get a better understanding of what you’re doing. Usually, on our side, we have regular meetings where we go over our pipeline and say which ones are interesting and which ones are not. Often, the interesting ones, we come and say, “Thank you, can you give us some data to support what you’re doing?” If you said you’re selling in retail, we’d ask you, “Do you have data to show how you’re doing in retail? Can you show us your financials?” Maybe if we have questions about the business or the operating model, then we’d ask those questions. That’s a way for us to start to get more of an understanding. At the same time, we start on our side also, doing our due diligence on the opportunity. I met a Kombucha company earlier. Kombucha is a space we know a decent amount about, but we have never looked at a company that deeply in the space. We generally know what’s going on, but now is the time for us to start doing our analysis, to say “What’s happening in Kombucha? Who’s been the big players? How’s it growing?” Maybe we also start talking to our network about it. Usually from all that, we kind of get to, “Are we doing our preliminary analysis? Is this something that we are pretty interested in?” At that point, if we say we are, there’s usually a decision point for us to have the conversation. Not to get into too many nuances, but it depends if the terms of the round, the financing terms, have been set by another investor, or if we need to set it. If we are going to set it, if we’re going to lead the financing round, then we would start thinking about doing a term sheet to set up the terms. If someone else has done it, then we will go to another level of diligence. This can be more in-depth team meetings, go check out your operations, talk to retailers, get intros from you. After getting comfortable, after we can agree on the terms of the round, then we get to an investment. As you can tell from that, the question on readiness is, it’s a fairly in-depth process. We expect and want the entrepreneurs to be on top of this process. You need to think about financing like a sales process. When you go to a retailer, you’re there ready; you have the sales sheet, you know the product, you know the pricing, you’re prepared to answer any questions, you’re ready to get on top of them. We want entrepreneurs who are showing us because this is us learning from you, we’re somewhat betting on you. This is us saying, “How good are you at knowing what you need to do? How good are you at answering the questions? Are we developing a good relationship?” The companies that aren’t very ready, they will quickly fall off, and those that are more ready certainly improve the chance that we may get to be an investment. John Hanak, moderator: Great, thanks, Andrew. Andy, same question. Readiness, diligence, but if you could also weave into there a little bit of a discussion of by the time you make the investment, how well you know the company and how well you know the team. Andy Miller: Very well. Let me go back to begin on the point of readiness because I can’t reiterate it enough, how important that is. I can give you three case studies — one where someone showed up with literally nothing, someone who had just a little bit, and someone who was very ready to put in front of us. We only looked at the one that was very ready. What does ready look like? One thing that you may want to consider is, do you have an advisor? Somebody that is helping you get ready. A lot of folks do that, and then you have to decide at the stage of your company whether or not, one, you can afford that and whether, two, it’s necessary. I think the first thing we look at comes across as usually a one to two-page overview of what your company is, what your growth plans are, and a little bit about the management team. I think for us when we look at our pipeline, that’s the very first thing. Does that seem to resonate with what we’re trying to do? That has to be like the sales sheet going into Walmart or Kroger or Whole Foods. You’ve got to be willing, cause that’s going to whet the appetite. Following that, if we have an interest, then we’re going to dive in a lot more, have a management presentation. Assuming that goes well, then that’s where the due diligence process starts. That is where we’re going to dive very deep. We’re going to want to know all about you, and we want to know about where you want to go with your company, what your background is. We’re going to want to know your manufacturing process, today and in the future. We’re going to want to dive very deep into your financials — both where you’ve been and where you’re going. Getting to know your company as well as you do, before we make the final investment. There are steps in between there, but if you’re going to get an investor and someone who’s very savvy at this, they’re going to want to have an intimate knowledge of your business before they’re going to write you that check. Andy Miller: Being prepared to have that dialogue and have that information ready. The companies that we like the most are the ones that when we call and say, “Send us this piece of information,” it doesn’t take three weeks to get it. It might take a day. Being ready, because again, you’re trying to impress this person, this investment fund, into putting a check into your company. Not to beat a dead horse, but that concept of readiness is just so vital. John Hanak, moderator: Great, thank you, Andy. Jacob, on to the next questions. 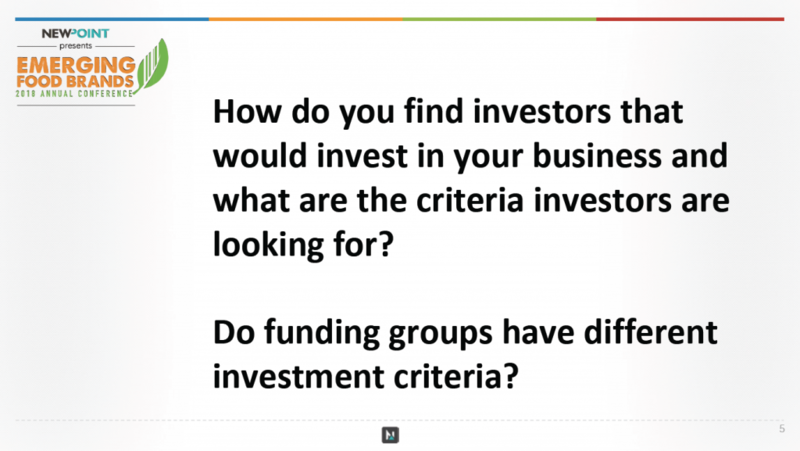 How do you find investors that would invest in your business and what are the criteria that investors are looking for? 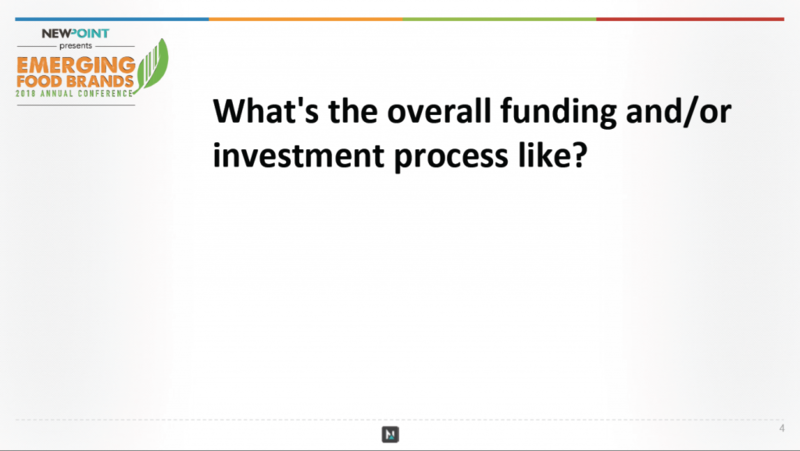 Kind of a related question of whether funding groups have different investment criteria. Jacob Schpok: I’ll start with the second question first. Yes, especially when we’re talking about seed capital and angel investors, it’s more or less the Wild West regarding what they look for. A lot of the time, it’s based on an individual’s personal background, and what they know they’ll invest in. The general search of finding appropriate investors, a rule of thumb is, after a point in which you begin the process of looking for investors, to the time when money is in your bank account—it generally takes six months. That’s if you have a good handle on your business. Not to repeat what you’ve just heard about being ready, but I would echo on there. It’s not just knowing where you want your business to go and what you’re going to do with the money. It’s truly the process of you eliminating assumptions in the way in which you articulate where you’re going with your business. It’s one thing for you to say, “We’re going to increase our annual reoccurring revenue by 20 million.” But it’s another thing to have defensible data points to show how you’re going to do that. We have these people that are ready to buy; we have these conversations. At the very least, you have people on the team that have experience that can secure that 20-million-dollar goal. When it comes to the actual effort of identifying these inventors once you have all your material together and the clock starts running, it’s socializing the deal. Even when you find that perfect investor, you’re still about three months out from money getting wired into your bank account — for example, the process of due diligence, which is after you pitch and everyone loves the idea. At that point, it’s just the investment firm doing their homework to make sure everything you said was factual. That alone takes 45-60 days. Those pieces, your business should be prepared for when it comes towards raising capital. What you’ll often find, if you have all of your ducks in a row and you’re ready to line up those investors, and if you start with a few firms or a few angels, is that it’s a tight-knit group. They know other folks, so even if they’re not the right partner to invest, chances are they’re going to open up the doors and either directly introduce or indirectly provide contact information of other investment firms that would be appropriate for you to connect with. My last comment on that is I’d say make sure you’re socializing; you’re going to networking events, as cliché as it sounds. There are people in those crowds that are direct investors or are associated with investors. There’s no amount of google searching you can do that can subsidize the value of developing your network. John Hanak, moderator: That is awesome. Thanks, Jacob. Andy Miller: Can I get in on that too, because this is one thing that I’ve talked to a lot of folks about. Also, don’t wait until you need money. I look around the room and several of you I’ve gotten to know. You’re not asking for money; you’re just telling me a little bit about your company. Keeping your company’s name out in front of the general public, potential investors, even if you’re not coming and asking. There’s nothing better that we like than when a company shows up on our doorstep, and we’ve already met them, we know them, they’ve been talking to us. Again, not about investment. I’ve looked through the Indiana Grow list. It was probably been six months ago, and I bet you I only knew ten of them, out of, I don’t even know how many, hundreds of companies on there, and I said, “Boy, wouldn’t it be great if we could find a way to get to know some of these folks a little bit more?” Long story, short, don’t wait until you need money to brag about yourself, to get your company out in front of folks, because you’re going to be way ahead if the potential investor already knows you outside the context of you asking for the check. Jacob Schpok: And, Andy, I’m sure when they’re meeting with you, you’re also helping steer so that they’ll have the best foot forward to pitch to you a year or whenever down the road. John Hanak, moderator: That is such great advice. We had a company that had just closed their series A of about 1.5 million and the CEO was taking meetings the next week for his next round because he knew the process never stops. He didn’t know what the next round would be, when it would be, or how large it would be, but he didn’t hesitate to take those meetings. Are you still looking for more information about investing, finance, or maybe you’d like to walk through something in this post? I’d love to hear from you. Contact me at patrick@newpointmarketing.com.